First tri of the summer | Snap. Flash. Smile. 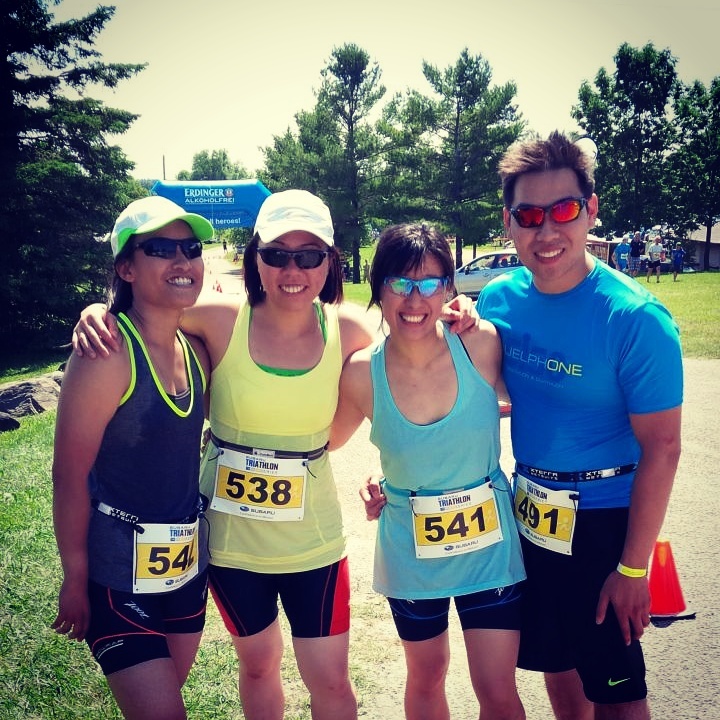 My friends and I after our try-a-tri in Guelph. A tad belated in posting but I finished my first Subaru try-a-tri a week and a half ago. This year we chose to attend the Guelph tri, as opposed to completing the Niagara route again. Note to self: when signing up for new routes or races pay attention to the layout of the race. When it states, “this course has rolling hills” – it really does have quite a few hills. Both the cycling and running courses had quite a few “rolling hills” which were not enjoyable when you have dry lips and heaving lungs. The swim itself went smoothly, though the transition took a while longer as we had wet suits this year. I really should have practiced getting in and out of them more, as well as added a few more open swims into my training regime. The wet suits are surprisingly buoyant and certainly affects the way your stroke is completed. However, the sea legs and tunnel vision I encountered last year when moving from swim to bike also wasn’t as fierce and I managed to stumble out of the water with a decent amount of grace. Overall, the tri was a success. Though I was eleven seconds (ELEVEN SECONDS) slower than my first tri, I placed better in my gender category at eighth overall. From my stats, it looks like I’ll need to up my game in cycling hills as that’s where I slowed down, and maintain/improve my swimming and running for the Iron Girl in August. Next up I’ll be attending the Walking Dead Escape Race in San Diego. Keep posted for news of and from San Diego Comic Con!